I usually don’t pay attention to hate rallies – there’s too many these days – but I’m having a hard time ignoring one in my backyard! Self-described “Patriots” have brought weapons to protest outside Muslim worship centers today. A perfect storm of Islamophobia is hitting the nation thanks to one so-called patriot from Arizona. 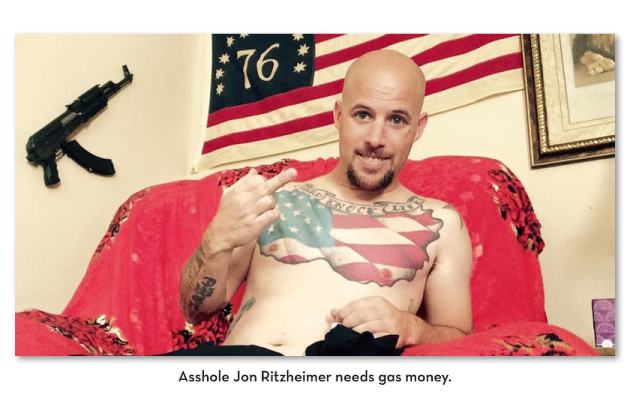 According to the Center for New Community, the protests are the brainchild of Phoenix anti-Muslim activist Jon Ritzheimer, who made headlines in May by organizing an armed protest outside a Phoenix-area mosque. Ritzheimer also has a history of issuing ugly threats, including his threat to arrest Michigan Sen. Debbie Stabenow for having voted in favor of President Obama’s arms deal with Iran. Even his fellow militiamen from Michigan disavowed that one. The Council for Islamic-American Relations issued an advisory urging mosque-goers to be careful and take safety precautions this weekend. These protests are a sad footnote in American history, and proof that this country does not guarantee religious freedom for everyone. Intolerance is the password for today’s protests.